Ball-Pythons.net - 46and2reptiles shares photos of some pretty ball python babies that they produced after their first sheds. Ball-Pythons.net - See photos of the pretty ball python babies that MAC Reptiles produced from a cinnamon lesser x black pastel pairing. 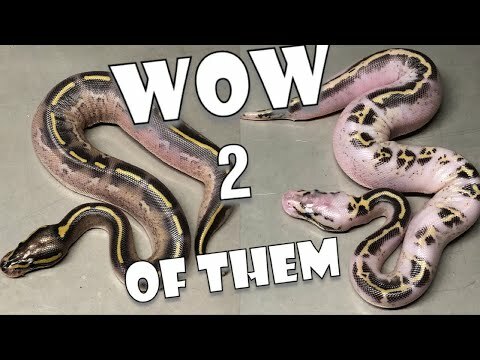 YouTube - Always Evolving Pythons shows off an awesome clutch of ball python babies that they produced. Bush League Breeders Club - Josh Jensen of J-Royals Reptiles shows off all of the fabulous ball python babies that he has hatched out so far this season. Ball-Pythons.net - Rance Meier of Monarch Ball shows off the pretty ball python babies that he hatched from a monarch pastel x normal het monarch pairing. Ball-Pythons.net - Noble Reptiles shows off the pretty ball python babies that they hatched in their fifth clutch of 2018.